by Hays, Danica G.; Erford, Bradley T.
Note: This is the bound book only and does not include access to MyLab™ Counseling with Pearson eText. To order MyLab Counseling with Pearson eText packaged with the bound book, use ISBN 0134522702. 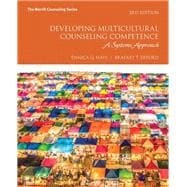 Designed to help students and new counselors acquire multicultural counseling competence, this book includes self-development opportunities for fostering awareness, knowledge, and the skills necessary for understanding cultural makeup, understanding others of diverse identities and experiences, and engaging in facilitative counseling relationships. Expanding on the features that made the first two editions widely popular, this revision provides a closer look at how to apply the information in practice through an expanded number of case studies and “Voices from the Field” features. The new edition includes additional information on ethics in multicultural counseling and operationalization of the 2015 multicultural and social justice counseling competencies; increases the focus on international and refugee populations and immigration issues; and provides additional coverage on alternative counseling approaches with multicultural competencies. Danica G. Hays, PhD, LPC, NCC, is an associate professor of Counseling and Chair of the Department of Counseling and Human Services at Old Dominion University. She is a recipient of the Outstanding Research Award, Outstanding Counselor Educator Advocacy Award, and Glen E. Hubele National Graduate Student Award from the American Counseling Association as well as the Patricia B. Elmore Excellence in Measurement and Evaluation Award and President’s Special Merit Award from the Association of Assessment in Counseling and Education (AACE). Dr. Hays served as Founding Editor of Counseling Outcome Research and Evaluation, a national peer-refereed journal of the AACE, and is Editor of Counselor Education and Supervision, a national peer-refereed journal of the Association for Counselor Education and Supervision. She served as President of the AACE in 2011-12. Her research interests include qualitative methodology, assessment and diagnosis, trauma and gender issues, and multicultural and social justice concerns in counselor preparation and community mental health. She has published over 75 articles and book chapters in these areas and coauthored or coedited these other books to date: Qualitative Inquiry in Clinical and Educational Settings (Guilford Publications), Mastering the National Counselor Exam and the Counselor Preparation Comprehensive Exam (Pearson), and the ACA Encyclopedia of Counseling (American Counseling Association). Professor Hays is also co-editor of the upcoming text, A Counselor’s Guide to Career Assessment Instruments (6th edition, National Career Development Association). She has been a faculty member at Old Dominion University since 2006 and her primary teaching responsibilities are doctoral-level research methods courses, assessment, and clinical supervision. Bradley T Erford, PhD, LCPC, NCC, is a professor in the school counseling program at Loyola University with primary teaching responsibilities in assessment, research, and lifespan development. He has held numerous professional leadership positions, including past president of the American Counseling Association, and published numerous books, articles and book chapters.